An inquiry into maternity care at hospitals has grown to include more than 250 families – 15 times as many as it began with. The investigation into Shrewsbury and Telford Hospital NHS Trust has reportedly already met with 50 families as its remit continues to expand. Former Health Secretary Jeremy Hunt ordered the investigation in 2017 after at least seven babies died at the trust during a four-year period. But a panel of experts set up to judge the inquiry was disbanded last week amid fears members would have conflicts of interest. The inquiry will look into alleged poor maternity care at the Shropshire hospital trust over the past 19 years. After the review was first announced only 16 families came forward, the NHS trust said, but there are now more than 250, the Health Service Journal reported. It’s being led by Donna Ockenden, former chair of the Royal College of Midwives, who revealed the expansion of the investigation in a letter to parents. Ms Ockenden now has more than 20 medical professionals on her team working to investigate the quality of care families received at the trust’s maternity units. She said in the letter seen by the HSJ: ‘Our work is continuing, and we are making good progress. ‘The review itself is of a very significant size – with more than 250 families’ cases now making up the cases under review. ‘As chair of this important review I know that the entire team is absolutely committed to working together and pooling their years of experience in a “search for the truth”. A panel of experts set up to look at the review’s findings was last week disbanded following complaints from families. They said involving staff from the Care Quality Commission (CQC), Royal College of Obstetricians and Gynaecologists (RCOG) could jeopardise the independence of its findings, because both had been involved in positive reports about the trust. There was also concern about the Royal College of Midwives being on the panel because it is representing some of the staff involved in the cases. After the panel was scrapped Ms Ockenden admitted it had caused ‘confusion and upset’ but insisted her inquiry wouldn’t be watered down. She said all the specialists on her team – including midwives, neonatologists, obstetricians, paediatricians and anaesthetists – are ‘completely independent’. As a result of the review now including so many more families, it is not expected to be completed before the end of the year. Ms Ockenden acknowledged some families had ‘suffered terribly for many years’ and in her letter added: ‘It is therefore so important that the maternity review team is given the time needed to undertake this vitally important piece of work. The mother of a baby girl who died shortly after birth believes her daughter would still be alive if she was born at hospital. 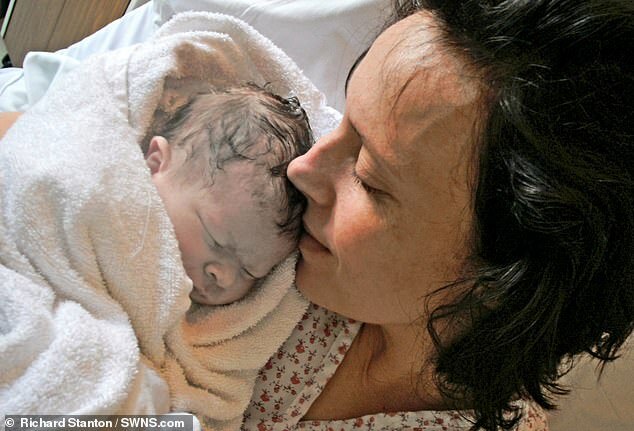 Rhiannon Davies said her daughter, Kate Stanton-Davies (pictured above), died in 2009 hours after she was born because of failings of midwives at Shrewsbury and Telford Hospital Trust. Ms Davies had suffered complications in the last month of her pregnancy due to a rare condition which means blood leaks from the foetus and into the mother. Just two hours after being born at the midwife-led Ludlow Community Hospital, newborn Kate suffered a collapse and was flown by the West Midlands Air Ambulance to Birmingham Heartlands Hospital where she died the same day. An inquest at South Shropshire Coroners’ Court in 2012 found the youngster could have survived if she had been born at a hospital instead. An independent review – commissioned by NHS England following complaints lodged by the Davies family – found the original probe into Kate’s death was ‘poor’ and had ‘multiple inaccuracies’. Mrs Davies told The Sunday Times in 2015: ‘Had the midwife at the unit recognised her condition at birth and called 999 in time Kate would still be here. ‘Kate was left in her cold cot in a hypothermic state, grunting, which is a sign of respiratory distress.